NNPS-TV's current production truck has been in use since 2006. One of the best things about the NNPS Telecom program is all the high-tech equipment available for the students to use. They work in NNPS-TV's large studio using lights, sets, and TV cameras to create their videos. In the control room, they use recording, switching, and audio systems. When they record the School Board meetings each month, they operate remote-controlled cameras. And they have a classroom full of Mac's with the latest editing software for video, music, photos, and graphics. But without a doubt, their coolest tool is the one on wheels: the remote video production truck. The production truck allows staff and students to video-record and/or broadcast live from remote locations. It enables them to produce football games and other sporting events and high school graduations each year. Just recently, Telecom staff and students recorded Christopher Newport University's graduation for production to DVD. Telecom's video feed from the truck is projected on the jumbotrons during the graduation ceremonies, too. In addition to greatly expanding the scope of programming that NNPS-TV can provide its viewers, a mobile production studio also allows students to learn TV production "in the field." And they learn how to work under the pressure of a production that will not be edited, known in the past as "live to tape." Today no tape is used - everything is digital - so it is called a "live recording" or "live to disc." 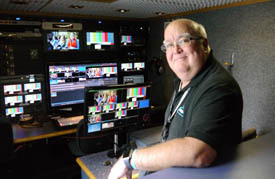 The truck is capable of broadcasting live, too, which means the TV audience can view the event/production as it happens. Football, graduations, and many other events have been both recorded and broadcast live over the years. The student TV crew can also go live on the Internet with a live stream, which they did for the 2017 graduations. Telecom bought this motor home from General Electric after the Suffolk factory closed. It became the school channel's mobile production vehicle, which was used for football games. Telecom students sign up to work a particular job on each remote production. Positions include: Camera Operator, Technical Director, Character Generator, VTR/ DDR Operator (Replay), Audio Operator, ENG Editor, Reporter, Announcer, and Assistant Producer. Working out of a remote TV production truck is something Telecom students have been doing for longer than one might think. NNPS-TV started broadcasting remotely in the early 1990s - over 25 years ago. The NNPS school cable channel started airing on Channel 36 on Newport News Cablevision in 1987, shortly after Telecom television production classes started. A few years after that, Paul Cummings, who was the first Supervisor of Telecom, was able to procure a motor home from General Electric (its factory in Suffolk had closed in 1986). The vehicle was a 35-foot long 1977 Winnebago, and it had been used to travel throughout the Midwest selling GE parts. The NNPS transportation department re-purposed the motor home to be used as the remote TV production truck. NNPS-TV Broadcast Engineer Gregg Swan outfitted the vehicle with video equipment to allow for five-camera productions. It was a "rolling production studio" during a time when TV studio equipment was not small. Work that is now done on a laptop was done on an editing machine nearly the size of a person. The 3/4-inch tapes were very heavy, and camera operators carried large video cameras on one shoulder, with an "umbilical cord" going to the recorder, which was carried in bag on the other shoulder. "30 years of TV at NNPS" is a continuing series of stories about the early days of the Telecom program and NNPS-TV. 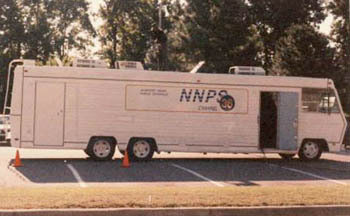 Along with the Winnebago production truck, NNPS-TV utilized a microwave van, which was necessary for the television signal, so two trucks were needed for remote productions. The earliest live remote broadcasts were from special events at schools, like when Governor Doug Wilder visited B.C. Charles Elementary School and Miss America came to Deer Park Magnet School in 1991. In the fall of that year, NNPS-TV started broadcasting high school football games (tape-delayed) using the production truck. They also covered basketball that winter. The first live football broadcast was in 1995, featuring Ferguson High versus Hampton High. "Live football was the most integral part of Telecom TV production training," said Cummings. Besides football, the motor home TV truck and microwave vehicle combo supported graduations, awards ceremonies, music festivals, leadership and technology conferences, and special community partnership programming like the Jefferson Lab Science Series. It was used for an "electronic field trip" to the Mariners' Museum and Relay for Life at Todd Stadium. According to Cummings, the remote production truck was converted three times over the years to keep the video equipment up to date. By about 2005, the Winnebago "wouldn't start anymore," according to current Telecom Supervisor Ray Price. It was 28 years old and had about 350,000 miles on it. Station Manager Jim Anklam pitched getting a new production truck to the school board. He cited the many school-related productions that were broadcast on NNPS-TV, such as the high school graduations, football games, and awards ceremonies. And besides needing a production van for covering NNPS events and airing them on TV, Anklam noted in his memo, a huge benefit of the truck is the educational opportunity it gives Telecom students. Telecom students work on a football "practice game" in 2011, with the production truck parked at Todd Stadium. "The immediacy of working on real-time, live events provides NNPS students with a level of experience that significantly enhances their opportunities to attend respected colleges of communication or compete for communications jobs after high school," Anklam told the board. The purchase of a new truck was approved, and after researching vehicles and getting bids - and designing the truck according to their needs - NNPS-TV purchased one from Gerling and Associates, which specializes in custom media-related trucks and trailers. The truck was delivered in the fall of 2006. The purchase included the "shell" only, no audio/visual equipment. Swan took the television equipment from the old truck and installed it in the new truck. "We kept it up to date, so the transition wasn't that hard," said Price. The truck was plain white when purchased. Later, the Channel 47 graphics were put on. Since its purchase 10 years ago, the remote video production truck has been used constantly, for remote productions ranging from sports to awards shows to student performances at Hollydazzle to CNU's 50th Anniversary Gala. The Telecom team joined up with the city channel (NNTV) to go live using the truck to broadcast City Council meetings held off-site. The truck was once even used to produce a college football game. The remote video production truck is used regularly to produce "Sports Highlights" and the exercise show, "Fuzion Fitness." After Swan retired in 2009, Bryan Catlin came to NNPS-TV as Broadcast Engineer. He maintained the production truck's A/V equipment and the station's TV signal and web servers. During the summer of 2010, Catlin upgraded the equipment in the production truck. Catlin worked on numerous multi-camera live broadcasts with NNPS-TV until his untimely death from cancer in 2015. He was always proud when outside Technology and TV staff and visiting educators and political leaders were impressed with the production truck and its capabilities. For example, in 2011, NNPS and Telecom were chosen to host a site visit by the National School Boards Association Technology Leadership Network. A highlight of their visit was a tour of the remote video production truck. And whenever NNPS-TV worked with CNU or the city channel, they were always very complimentary about the truck. In August of 2015, current NNPS-TV Broadcast Engineer Greg Lesko began working in and on the truck. The next year, he converted the equipment in the truck to HD. High Definition Hitachi video cameras were purchased and the cabling was upgraded. A new audio board was added at that time to improve sound quality, too. The video recorders did not have to be replaced because they were capable of handling HD. The first HD remote TV production was the Dr. Mary V. Bicouvaris Memorial tennis match, held in April of 2016. Besides football, basketball, and tennis, nine other high school sports have been produced for television by Telecom staff and students. Baseball, softball, soccer, wrestling, track and field, swimming, gymnastics, volleyball, and lacrosse all have been aired on the NNPS channels, thanks to the remote video production truck. As a learning tool for TV students; a resource for the school system, the city, and the community; and a vital source of programming for the NNPS-TV channel, the remote TV truck is an invaluable piece of equipment. And it's also pretty cool.